This June the staff of the “Geology and Geophysics” Department of Samara Polytech took part in a scientific expedition of the Triassic and Jurassic deposits in the southeast of the Samara region. One of the findings, made with the participation of the Flagship University scientists, was the skull of a Wetlugasaurus. Then it was just a piece of rock with bones protruding from it and it was difficult to identify anything valuable. In the process of studying the skull, it was prepared from the palate side. The teeth and internal nasal apertures – the choanae – became clearly visible. “Experts of the leading paleontological institute of the Russian Academy of Sciences (Moscow) conducted a detailed assessment of the findings”, says the senior lecturer of “Geology and Geophysics” Department Alyona Morova. She added that that they were lucky to find the fullest skull of a Wetlugasaurus in the world. Alyona also said that the news was completely unexpected for the scientists. The expedition was held with the support and participation of the Paleontological Institute of the Russian Academy of Sciences, Samara Regional Museum of Local History named after P.V. Alabin, Samara Paleontological Society, Togliatti Local History Museum, Institute of Ecology of the Volga Basin of the Russian Academy of Sciences. The expedition was headed by Igor Novikov, a leading researcher at the Paleogerpetology Laboratory of the Paleontological Institute of the Russian Academy of Sciences. 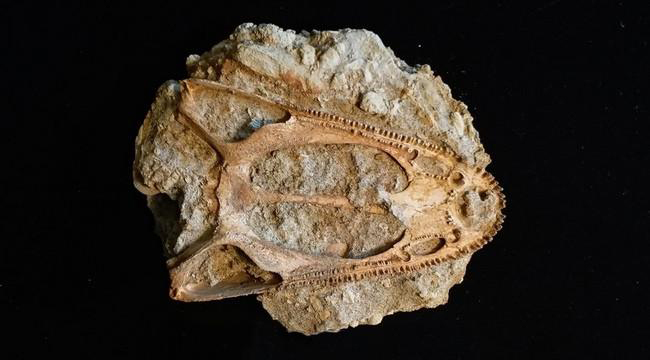 Polytech scientists were also lucky to make another unusual discovery – the remains of the postcranial skeleton (more than 170 fragments) of one specimen of Labyrinthodont. In addition, they collected zoological materials of modern mammals and herbarium specimens of plants, including several rare and Red Book species.